Welcome one and all to my inaugural blog. So... Let's get right into it shall we. I'd like to talk about the most highly discussed move in comics. 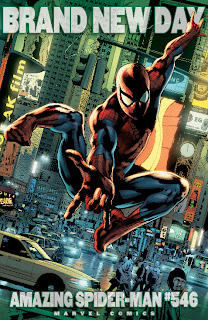 Spider-man's One More Day and Brand new day story arch's. In One More Day, Spider-man makes a deal with Mephisto (marvel's substitute for satan) to save his aunt Mays life. Why is this a terrible move? 1. He's the devil! You don't make deals with the devil. Go ask Ghost rider how good his deal with Mephisto was. Do you really want a flaming skull Spidey? 2. Aunt may is an old woman, she is going to die soon. In fact she's already died once and comeback. 3. Mephisto isn't even a staple of the Spider-man books, he is completely out of place next to Spiderman. Their colors run together. Now Peter Parker didn't sell his soul to Mephisto. He sold something more important his love for Mary Jane. He changes history so that Mary Jane and Peter Parker never got married. Effectively erasing 30 years of Spider-man in the marvel universe(how is erasing mostly good comics from continuity a good thing?). 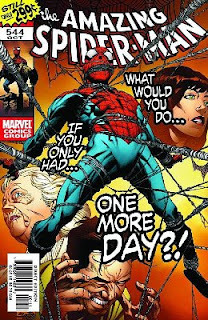 Also erasing one of the best runs on Spider-man, the current run by J.M.S. Who broke new ground with actually using the marriage to draw out stories and made bold moves with characters that actually helped them grow and become more relevant. i.e. Aunt May learning Peter's secret, and his run on the New Avengers. Him not being in the New Avenger's is really what hurts me the most as I love that book and the way he plays off Luke Cage, and Wolverine. What ticks me off royally isn't the results of his actions but how totally out of character a decision like this is. 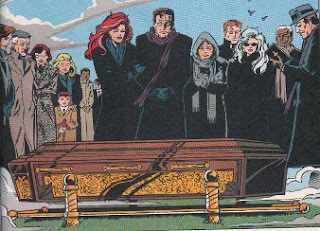 Spidey while you're selling "pure love"(as Mephisto calls it) Why not get rid of the biggest guilt of your entire life letting Uncle Ben die. That would be to logical for Spider-man I guess. So, Spider-man and MJ are no longer a couple I'm over it. Let's move onto Brand New Day. I really wanted to hate this comic and I'm kind of sad to say I liked it a little. We are essentially getting stories about the Spider-man of the sixties. Single and ready to mingle and cursed with horrible luck(he deserves it selling your soul to the devil...come on). I've only read about the past year and a half of Spider-man, so it was nice to see the novelty of Spider-man in his original state. However I feel like marvel is making the same mistakes it has in the past. Living off of gimmicks bringing back Harry Osborn from the dead, and putting J.J.J. in a coma(because of Spidey.) I think I'm going to drop this comic after issue 548 unless it really blows me away as my form of protest against marvel and their crappy decision making. Another thing that bothers me about this book is it's first villain some one I have never heard of before named Mr. Negative(no it's not me) and as far as I can tell he's brand new. Which will be the topic for my next blog. Why do the top super-heroes get all the good new villains? I don't think it's the new direction that's good, I think it's the writer. In other words, Slott could have written an excellent married Spider-Man. Congrats on starting your blog, I like the title! I enjoyed your blog. It made me remember, as a kid I use to read comic books. I have great memories of that. I enjoyed this. I have great memories of reading comic books as a kid.